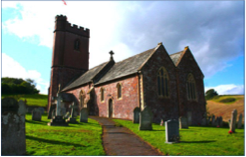 ​The parish church of St Michael and All Angels is located next to Dunchideock Barton – see Google Maps – and is part of the Teign Valley and Haldon Hill Group of Churches, which includes Ashton, Bridford, Christow, Doddiscombsleigh, Dunchideock and Dunsford. The 14th/15th century, Grade 1 listed church is open daily and visitors of all faiths and none are always welcome to experience the peace and beauty of this lovely place where all kinds of people have come to worship, pray and celebrate significant moments in their lives for over a thousand years – and still do so today. Ruth Frampton became the new Priest-in-Charge of the Teign Valley and Haldon Hill Group of Churches (which includes Dunchideock). Ruth and her husband, Giles, will be living at the Rectory in Christow. The history of the Church and the surrounding area can be found here in the History section of this site. Information about services and contact details can be found here.